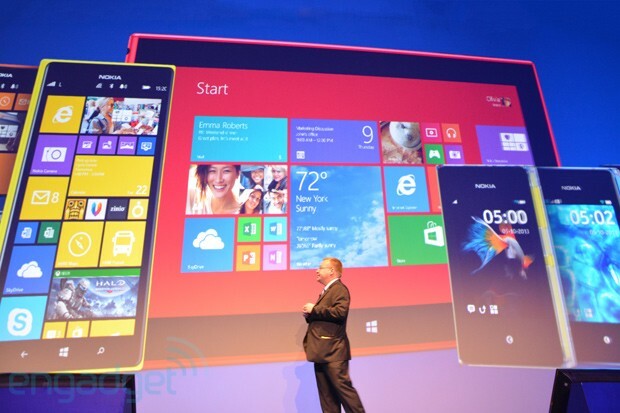 All eyes are on Stephen Elop. Just hours ago, he introduced Nokia's first Windows tablet; he's also overseeing his division's integration into Microsoft; and Redmond is even considering him as its next CEO. During our interview today, Elop understandably couldn't comment on the prospect of taking Steve Ballmer's place, but he did say he's ready to take up the challenge of bringing the two giants together, no matter what. "I'm looking forward to being a part of driving that change within the company in whatever capacity," Elop said. While Nokia continues to maintain its own product portfolio for now, the timing of today's Lumia 2520 unveiling and the global retail launch of Microsoft's new Surface tablets seems to be too much of a coincidence. However, Elop brushed it off with the usual message that the Windows ecosystem would benefit from having more choices for consumers. In the case of Nokia's tablet, Elop believes it will appeal to an audience that both overlaps Microsoft's and complements it. He emphasized that Nokia took a slightly different approach, focusing on mobility with the integrated LTE modem and outdoor-friendly display on the Lumia 2520. For the same reason, Nokia went with the more efficient, yet much-ridiculed, Windows RT over Windows 8. Elop justified the decision, pointing to improvements offered in RT 8.1; his favorite being the addition of Outlook to the preloaded Office suite. "Just for myself, the very first version of Windows RT, that was a bit harder for me to consider putting in my bag," Elop said. "This device (Lumia 2520) goes into the bag, because I can have, with the cover, 15 to 16 hours of battery life, which is huge." Heikki Norta, VP of Connected Devices, added that Windows RT's app download model contributes to a more secure nature, plus "there's no digital dust collecting in the corners of the system," so it'd behave more like an appliance with much less performance deterioration. As for the oddball in Nokia's current lineup, the entry-level Asha series seems to have a bright future even after Microsoft's acquisition. Elop pointed out that from Microsoft's point of view, there's an attractive opportunity to expose "the next billion people" -- especially those from India, Indonesia, Mexico and Pakistan who can't afford a PC or a tablet -- to the company and its services like SkyDrive, Bing and Skype for the very first time. The same goes for social network services like Facebook and WhatsApp, both of which have gained a large number of new subscribers courtesy of Nokia's volumes in that price segment. Earlier today, WhatsApp CEO Jan Koum went on stage to announce that Nokia devices are adding 250,000 active users to his network every day. On a related note, Elop also announced that Instagram will finally be coming to Windows Phone. While he acknowledges this as an important milestone, he cautioned that filling up this gap only takes Nokia to par instead of making it truly competitive. He also pointed out that a ton of applications doesn't make a winner, and sang the praises of Nokia's design, imaging, location-based services and other differentiators. When asked what the next milestone application would be, Elop looked at the bigger picture instead. "The big moves in technology tend to come when there's a major change in the user interaction model, how you interact with the device," Elop said, referring to the impact of the Xerox Star on the windowed UI and the iPhone on the touch interface. "At a certain point, those new user interaction models are figured out and take hold, and that heralds a whole new generation of experiences. And of course, we're all working vigorously on those types of things, and you'll see us work towards those in the future."